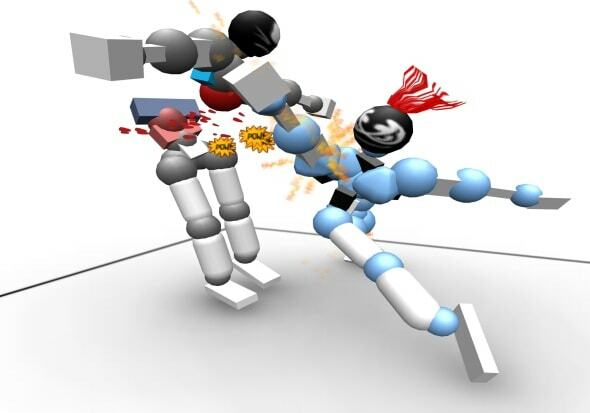 Toribash is a very wacky physics fighting game, created by Nabi Studios. The game was created from the ground up for the WiiWare downloadable gaming platform and was released on 9th July 2010. There is a version for the PC, which is a free download and was a ‘Best Game Idea’ finalist at the 2006 Swedish Game Awards. The Toribash WiiWare version cost 1000 points, while the PC version has remained free and has a huge fan base. If you have played the PC version, you probably won’t see many differences in game play. The objective of the game is to beat your opponent using moves that are all completely physics based. You take turns by moving the joints you select on your fighter and ending your turn. With this game being based around ragdoll physics, the fights are always different and the variety of moves are endless. For instance, if you wanted to perform a jump, you would have to relax all the bones in the body, allow the fighter to fall, than using the fighters hips and legs, push against the floor with some force. There are a few tutorials on how to operate the game, but it can still be a little awkward at the beginning. When playing normal games, we are used to using a d-pad or joystick to walk. In Toribash, you walk by actually doing it the scientific way, which is to fall forward and place the foot down. This way of playing the game forces it to have a steep learning curve and can take some time to get used to. At the start gamers will have to get used to seeing their fighters fall on the floor and roll around till the end of the match. The match ends by points, out of the ring or having a body part on the floor which aren’t the hands or feet. If you do persist with this game, you can pull of some very fancy movements. Some of my personal fights have literally turned into Matrix-like fight scenes. There is a whole fan base that actually don’t fight each other but rather focus entirely on doing fancy movements and uploading their movements onto YouTube. There are very few differences between the Wii version and the PC version. The Wii version was actually built from the ground up and looks different. The actually physics in the Wii version seem to be a slightly smoother and has an extra option to boost your fighters movement. You can save your replays and send them to your friends. The game is online and you can communicate through text. The real question is, do you really need to buy this version over the free PC version? Personally, I bought this game because I tend to play games with friends and get very competitive. It’s not easy sitting around a desktop PC and playing games with your friends but always easy to do it with a Wii in a front of a TV. Other than that, I can not actually think of a reason to have this over the PC version. If you happen to be a major fan of Toribash and simply curious about the Wii version, you might find the whole boost in the moments interesting, as it gives you a whole new set of moves. If you want a fun game to play with your friends, buy the Toribash WiiWare version. Other than that, download the PC version. The PC version is near enough the same game.